Total Party! 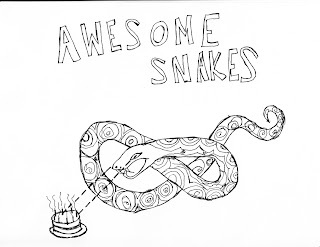 It's a Summertime Birthday EP from Awesome Snakes, featuring members of Awesome Snakes. Music and lyrics written and stolen by Awesome Snakes. Snake Cake was recorded by Neil Weir at Old Blackberry Way in the Spring of 2009. Snake and Cake art by Konrad Purski. Awesome Snakes is Annie and Danny. Thanks for the music. Download my free (100% sick) haunted mixtape. Support Mpls artists!